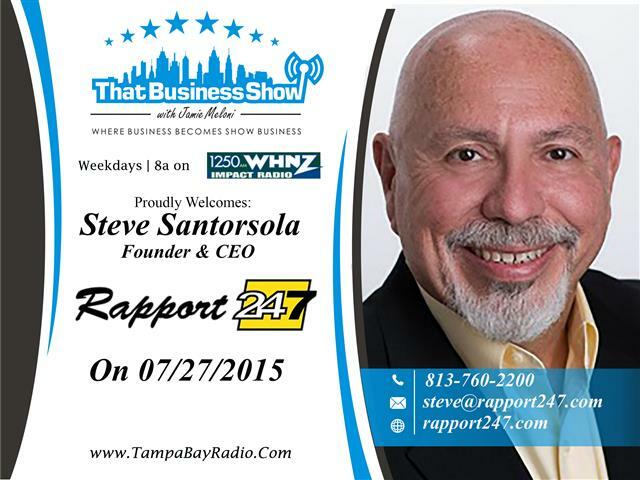 #ThatBusinessShow kicks off week 26 today and airs weekdays at 8am on 1250WHNZ and is available live on http://www.tampabayradio.com. All past shows available On Demand as well on the site and also videos are published to my YouTube channel located here https://www.youtube.com/user/jamiemeloni – The show is always looking for guest and sponsors, contact Jamie at Jamie@tampabayradio.com for more information! 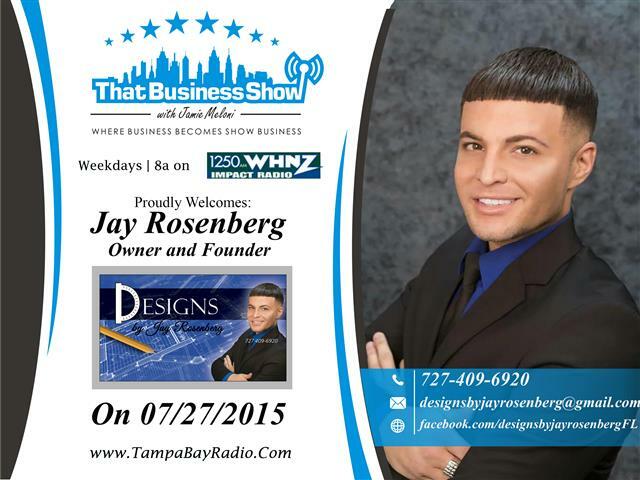 My opening guest today was Jay Rosenberg, Owner and Founder of Designs by Jay Rosenberg. Jay’s company specializes in interior design, staging, as well as remodeling and he found his passion for interior design at a young age through trips to homes with his mother. His talents for design shown through at the empty and lacking homes and quickly people were asking him for assistance in design and paying for his services. Today, he works with a number of home builders on staging homes as well as Real Estate investors looking to flip their purchases. Jay is also very involved in the community and talks about his involvement with the American Foundation for Suicide Prevention, Hands Across the Bay as well as Dean Headstrom’s Foundation for Melanoma Awareness on this opening segment. 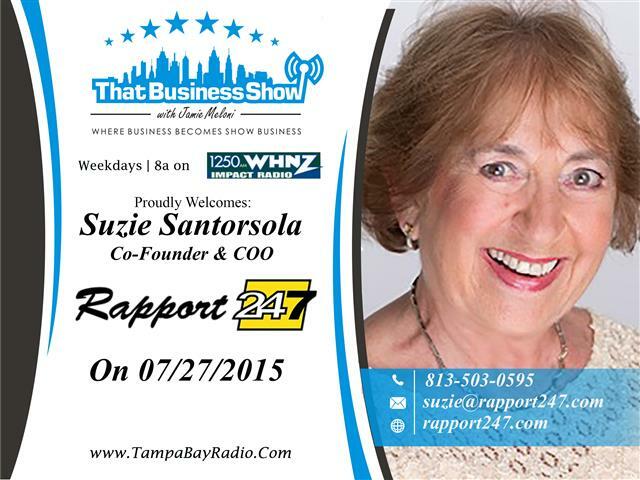 On the 2nd half of the show, I welcomed to studio, Steve and Suzie Santorsola, Founders of Rapport 24/7. This is a Tampa based tech company that specializes in business to business software development with a focus on video. They were joined in studio by Eric Lamar Smith, a Preferred Provider of theirs and Owner of My Hangout Academy, where he uses Google Hangouts to enhance business owners through the use of Google Hangouts and video and Matt Nelson, an Advertising specialist. Steve opens the segment with a discussion of their video application that allows for ease of use, on-location video taking through the use of a smart phone or tablet device. Through their subscription based platform, users can then easily transfer this video to their platform where it can then be disseminated to their social media platforms, resulting in consistent, fresh video information, of which the search engines love. Users can use the software for video testimonials in the field for instance and this also gives them the ability to capture positive video reviews by handling them on the spot, rather than asking for people to give them at their leisure. Eric along with Steve and Suzie will be holding a training on this platform as well as much more about Google Hangouts and how they can amplify your business on August 4th from 9am to 4pm and is located at Studio4K at 12501 62nd St N in Largo, FL – learn more and reserve a seat at http://www.socialtripleplay.com. Also, learn more about Rapport 24/7 at http://www.rapport247.com and reach out to Steve or Suzie at 813-760-2200 or 813-503-0595 for more information. They are also available via email at steve@rapport247.com or suzie@rapport247.com! This entry was posted in Entrepreneurship and Business and tagged american idol, branding, business, coldwell banker, entrepreneur, interior design, rapport24/7, staging, video branding, video marketing. Bookmark the permalink.